Anyone who's ever needed emergency treatment for an injury, illness, or other sudden health condition can attest that hospital emergency rooms are often overcrowded, understaffed, and extremely hectic. Considering that people in the United States make nearly 137 million visits to the emergency room each year, the chaotic nature of emergency departments isn't that surprising. Hurried doctors, nurses, and other medical personnel sometimes have just seconds or minutes to assess a patient's condition before moving on to the next. But despite the frantic hustle and bustle of the ER, the medical professionals who work in these stressful environments are still required to provide patients with an acceptable standard of care. When they fail to do so, the consequences for patients can be disastrous—or even deadly. Nurses, doctors, hospitals, and others may potentially be held liable for the injuries and harm that results. If you suspect you or someone you love was the victim of emergency room medical malpractice in Georgia, here's what you need to know before taking legal action. Fatigue. While full-time emergency room physicians usually work shifts lasting between six and 12 hours, interns and residents—who, along with nurses, typically do much of the actual work with patients—can work shifts as long as 28 consecutive hours. Insufficient medical history. When a nurse or doctor fails to obtain a patient's full medical history, they risk subjecting them to medications to which they're allergic, dangerous drug interactions, or other contraindicated treatments. Inadequate warnings. Patients must be adequately warned about the potential risks of suggested treatments to make informed decisions about their medical care. Distractions. Because emergency room nurses and doctors are often treating multiple patients at once, it's easy to become distracted, especially if the medical provider is suffering from fatigue. This may cause them to miss something important while examining a patient, or fail to follow up after ordering the administration of medication. Miscommunications. In some cases, doctors or nurses may convey inaccurate instructions to others, leading to mistakes in patient care. 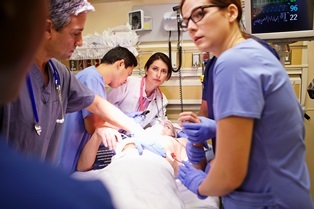 An American Medical Association study found that doctors specializing in emergency medicine are among the physicians most commonly sued for medical malpractice. A study from John Hopkins University noted that diagnostic errors are the mistakes most likely to lead to medical malpractice litigation. Were You a Victim of Medical Negligence? Unfortunately, not all bad outcomes in the emergency room can be considered medical malpractice. To have legal grounds for a malpractice lawsuit, the healthcare professional in question must have owed the patient a duty to provide the accepted standard of care—and then breached that duty, resulting in harm to the patient. See a doctor you trust for a diagnosis or second opinion. Adhere to the doctor's treatment plan and attend follow-up appointments. Obtain your medical records and save all documentation from your ER visit. Write down everything you remember about your visit to the emergency room and the care you received there. Consult an experienced medical malpractice attorney. If you suffered medical malpractice in a Georgia emergency room, pursuing a lawsuit against the entities responsible allows you to seek compensation for related medical expenses, lost wages, pain and suffering, and other damages. Do you have questions about a medical malpractice case? Contact Van Sant Law today to schedule an appointment for a free initial consultation to discuss the details of your case with a member of our legal team. Don't wait: the time to file a lawsuit is limited!